Image Size: 34"w x 21"h.
Those who are fortunate enough to see Z.S. Liang’s work in person are quick to compare him to the great masters of modern Western art, from Frank McCarthy to Howard Terpning. Within the last year alone, the market for both Liang’s originals and limited editions has erupted. "Pueblo Street Market, 1920s," was Sold Out at Publisher within thirty days. 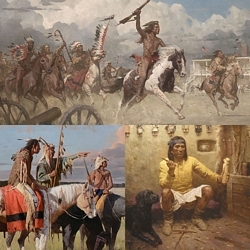 This is your chance to purchase a spectacular and dynamic work from one of the rising stars of Western art—don’t miss out!